Machine vices for every requirement. This is where producers of small series, of serial-produced products and vocational training companies will find the right clamping system. Take advantage of our 24-month warranty, express repair service and parts availability for at least 20 years from the date of purchase. Your specialist for machine vices with over 45 years of experience. We supply the right clamping system for every clamping task. 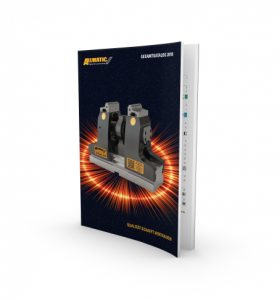 Find all current clamping systems and suitable accessories in the new product catalogue. Browse the catalogue for suitable products! Subscribe to our newsletter and receive news on the topic of clamping, tips on the use of our machine vises and all innovations to our products. Environmental protection is written with a capital E in our company. All our products are produced in the parent company in Unterthingau. To avoid unnecessary CO2, we work with regional suppliers. Advantage: lower environmental emissions, faster delivery times. Take part in our corporate life. Visit us on YouTube.